The course encourages students to design and make products with creativity and originality, using a range of materials, including paper & card, resistant materials and smart materials (simple electronics can also be studied). Packaging, labelling and instructions are also encouraged as part of the complete design proposal along with marketing tools, such as advertising and points of sale, which can be used to supplement the making experience and help create products which can be evaluated for their commercial viability. Much of the course will be delivered by means of a practical ‘hands on’ approach. The course encourages students to design and make quality electronic products with creativity, originality and flair using a wide range of electronic devices. 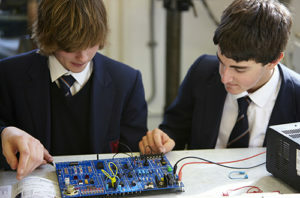 The packaging of the electronic circuit can include individually-designed cases made from a range of resistant materials, textiles, card or recycled materials, or students can purchase a commercially-made case and modify it to meet their project needs. The course will be delivered by means of a practical ‘hands on’ approach including two mini projects; a microcontroller-based electronic dice and a mini roulette game. Examination (40% of total marks) – a 2 hour exam based on the subject content, which includes a simple design question. The examination is taken at the end of year 11. 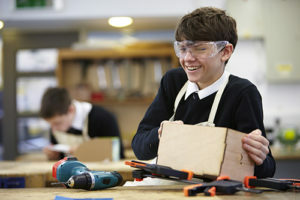 Controlled Assessment (60% of total marks) – a design-and-make activity which is selected from a broad range of board-set tasks. Students will produce a design portfolio (this can be submitted electronically using PowerPoint or in printed format) and a 3-dimensional product to be completed at the end of year 11 that pupils will keep. The emphasis is on quality rather than complexity. Why choose Design & Technology? Curriculum links with Maths, Science, Art, Business, IT, English.